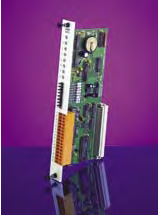 The robust Sensaphone Express II features advanced monitoring capabilities, plus allows for expansion of to 40 input/output channels. Easy to install, program, and expand, Express II can meet the needs of your system both today and tomorrow. 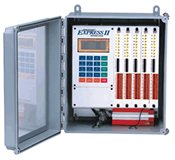 The Express II is as flexible as your application requires, with features like built-in power failure monitoring, 8 universally-configurable alarm inputs, and an on-board relay output for manual or automatic switching. It offers a wide range of temperature sensing (-85˚F to 300˚F), 48 user-programmable dial out numbers, and complete remote touch-tone programming capability. Descriptive messages can be recorded for site identification and for each alarm input. Alarm-specific dialing and programmable call schedules allow users to customize the Express II’s dialing process. The Express II is equipped with a gel-cell rechargeable battery that will provide 12 hours of backup time. The unit is housed in a NEMA-4X fiberglass enclosure with a front panel LCD and dual-color LEDs to indicate input status to on-site personnel. All programming settings and voice message are stored in nonvolatile memory.